I’m starting to see introducingbooks.com as one of my new favorite visual guides into literature. But of course, other great topics offered are psychology, science, politics, semiotics, sociology, religions, linguistics, cultural studies, gender studies, economics, anthropology, and philosophy. The list within each topic is obviously still growing, and I was very impressed when I got my hands on INTRODUCING KAFKA. David Zane Mairowitz does a great blend of writing Kafka’s biography and his own work together within this graphic novel. The storyline lets the reader see when Kafka’s work emerged and what he was thinking or going through during that time that could have inspired him to write. This is a very insightful way of understanding one’s writing process, particularly Kafka’s since his work could be perceived as being derived of the norm when he had lived. I’ve heard from a few people that Robert Crumb’s art is slightly disturbing or has an unattractive appeal, but I feel his art fits with this particular graphic novel rather well. Crumb’s artwork is very sharp and detailed in black and white. I’d say that the artwork is equally as detailed as the text, and this graphic novel definitely requires the reader to read both the text and image at the same time for the full explanation. There are a few sexual and violent images, but nothing that strays away from the purpose of the story. 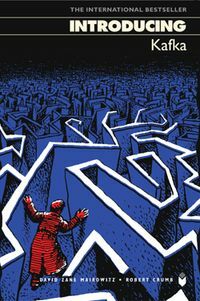 INTRODUCING KAFKA is a great in-to graphic novel in regards to reading any of Kafka’s work and understanding who Kafka was as a man and writer. Perhaps the other strength with this graphic novel is exploring how writers, in general, find inspiration. This could be translated toward students who struggle to find a worthy or interesting topic in their own writing. Just having a discussion about the writing process can perhaps help students think where they can draw their own inspiration.